Who They Are: A monthly gathering of lesbian and bisexual women every month. It was founded in 2003 by Charmaine Tan and Eileena Lee. What They Do: Discussions and talks about anything related to the lives of gay women. Women’s Nite is a monthly gathering of lesbian and bisexual women in Singapore. Their events offer a safe space to talk about relationships, love, sexuality in a safe, neutral and alcohol-free environment. Previous topics included: “Rent, buy or with the folks?”, “Out Or Not” and “Reaching Out”. 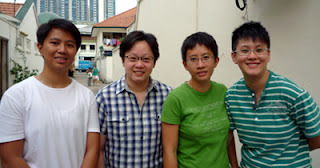 We catch up with some of the volunteers behind Women’s Nite Gea Swee Jean, Sylvia Tan, Tan Hui Yee, Joey Kang. Why do you think Women’s Nite is important? SJ: I really believe in Women’s Nite because of all the lesbian-related communities in Singapore, we happen face-to-face. We don’t have a strong online component, but we believe that we’re getting people to take the next step to be more open. HY: The whole idea behind Women’s Nite is to break away from the kind of interactions you have in clubs. For people just coming out, it can be very intimidating walking into a pub to make friends. At Women’s Nite we focus a lot on networking and making platonic friendships. Baring your soul to a bunch of strangers sounds scary. Are people game for it? SJ: it’s a safe space and we have a disclaimer that whatever we talk about is confidential. It’s casual, we usually do it potluck-style in someone’s living room. We are a very beginner-friendly environment. HY: We take efforts to make you feel comfortable and ensure that information is kept confidential. We try to make sure (well, as much as we can) that the people who come are not weirdos. We also keep an eye out for people who are a bit unsure or who are here for the first time. Any plans to grow Women’s Nite? HY: Personally, I think it would be good for people to feel empowered enough to form their own support groups. Every woman who leaves Women’s Nite, after they have found their own support groups, I hope they will offer the kind of help that others gave to them before. Next PostPink Dot 2011 – now supported by Google Singapore!